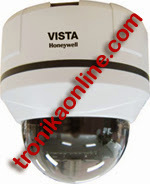 Honeywell Vista series VSD-100P Mini Speed Dome camera adopts x10 optical zoom providing ultra high resolution image with more than 540TV lines in color mode. 360° continuous rotation at maximum 400°/second speed guarantees quick response in order to capture any emergencies. With True Day/Night switching, this Vista camera is perfect for indoor environments.